Where's Oliver, you're wondering? Well, Oliver had a little mishap at the beach. It took up a week to figure out what was wrong and he quickly ended up in emergency surgery. He's home now and unfortunately will not get the joy of tasting these Belly Bites because he's on a totally soft diet. Tanner, however, gave his impression with a big high five and is hoping to get more opportunities to taste test soon. 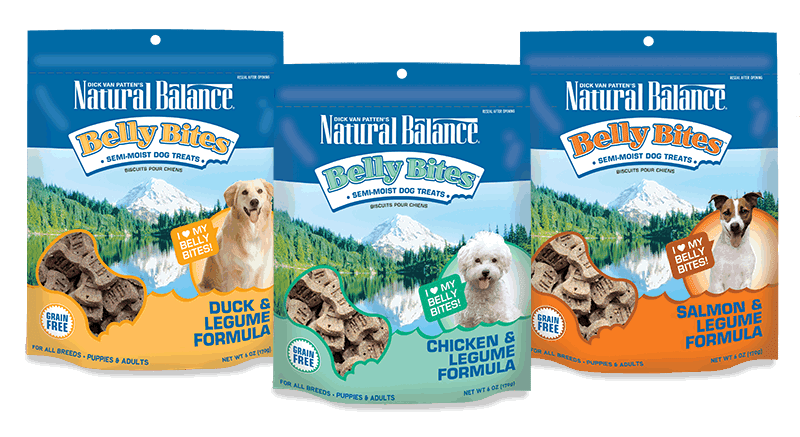 Let's get on with this intro to the newest member of the Natural Balance treat team--Belly Bites. They sound delicious, even before you read the information on the website or news release. These semi-moist treats come in 3 flavors that are all paired up with legumes, offering adequate protein and fiber paired with grain-free goodness. Legumes are the dried beans like Garbanzo beans and Peas that are high in protein and fiber. Belly Bites come in Duck and Legume Formula, Chicken and Legume Formula and Salmon and Legume Formula. With 14% crude protein from the primary ingredients and the legumes, these treats sound like they're ready to power your dog through a day at the races. We also love that they are made with natural flavoring and natural preservatives, as well as skim milk--all healthy ingredients that we love to get behind. And guess what? For a limited time, you can grab a $1 off coupon at each of the links above, just click here for one. That's right! Save $3 when you buy 3 bags of these nutritious, delicious snacks. That opinion, of course, came from Tanner. He got to taste test the Chicken formula and is really looking forward to trying the Duck version. After all, he is a Golden Retriever; his DNA speaks duck! These moderate-sized treats are easily broken to adapt to the size of the dog and the frequency of treating. We recommend you watch Fido's waistline by treating moderately. Watch for a giveaway coming soon. Meanwhile, I want to share with you some info on the photo contest going on over at the Natural Balance Facebook page. 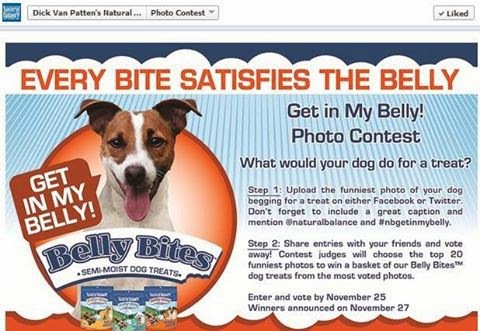 Through Monday, November 25 Facebook fans can submit the funniest photo of their dog begging for a treat. Don't forget to include your best caption for Fido's image which you visit the Get in My Belly! Photo Contest. Winners? You bet! The top 20 vote-getters will score a basket full of Belly Bites, enough to share with their playmates at the dog park. Isn't it wonderful that they'll have energy enough to run and play and socialize! That's what healthy snacks are for--fueling the adventure. Enjoy! All Things Dog Blog shares Natural Balance news and information in a sponsorship program as an NB Insider, in which we receive paid participation in industry events and food for our pets.